If you've made healthy eating goals or resolutions for the new year but don't want to sacrifice one morsel of good taste and happiness, check out my new miniseries on Serious Eats this week and next. 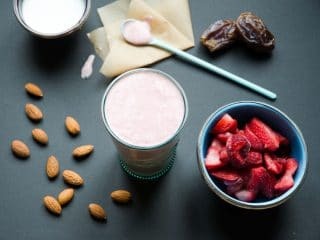 It premieres with a super-healthy but totally indulgent-seeming Strawberry Shortcake Smoothie recipe. All plant-based, all yum. Get the recipe below and read the whole story here on Serious Eats. Love healthy strawberry smoothies? You might also like our Strawberry Lemonade Smoothie. This creamy, just-sweet-enough smoothie makes it easy to keep those healthy eating resolutions. Combine berries, almond milk, dates, flax seed, protein powder, vanilla, and maca powder in blender. Blend on high speed until completely smooth, about 1 minute. Smoothie can be kept in a sealed container in the refrigerator for up to two days. Reblend or shake well before serving. I love to use dates as smoothie sweeteners, and I especially love the caramel-like flavor they add to this recipe. 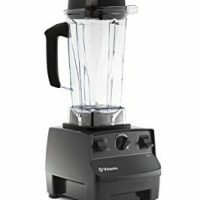 But some blenders, especially older ones, can have a hard time getting dates completely smooth. If you'd rather, you can substitute a liquid sweetener of your choice to taste. Maca is a Peruvian root vegetable full of magnesium and other minerals. It's said to be an aphrodisiac, but you didn't hear that from me. You can find it dried and ground into a powder at many stores with a natural foods section, and right here. It's used in this recipe for both flavor and nutrients.